In 2012, The Global Citizen Festival threw one hell of a music party. In 2013, they’re doing it again. 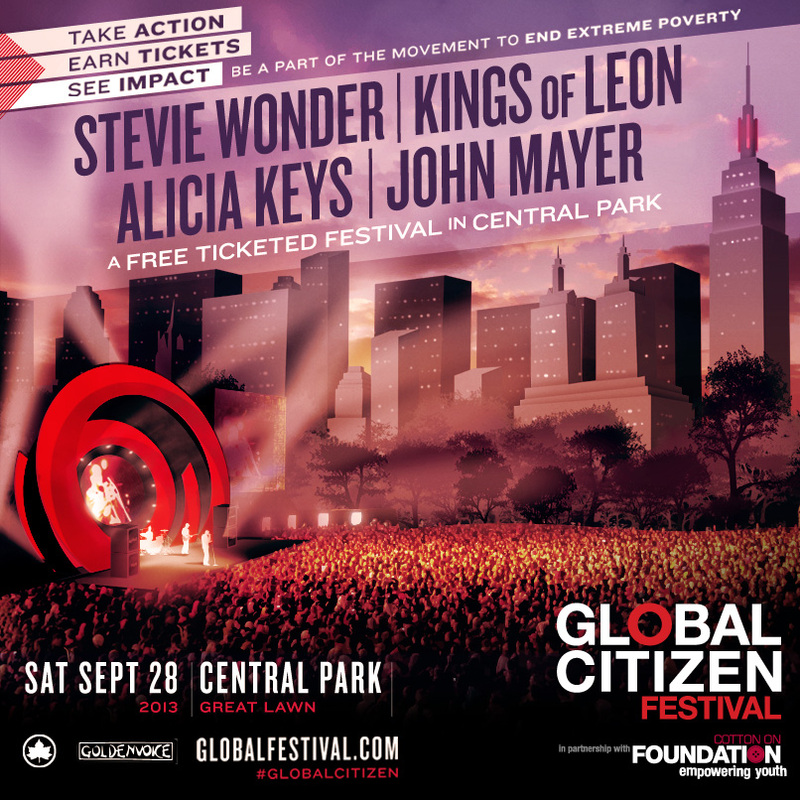 The 2013 Global Citizen Festival will be a free ticketed concert in New York’s iconic Central Park. Headliners include Stevie Wonder, Kings of Leon, Alicia Keys, and John Mayer. Want to get free tickets? The Festival will be held on September 28, 2013 as world leaders gather at the United Nations General Assembly in New York. Use the most powerful tool available for change—your voice—to give world leaders a clear mandate to end extreme poverty by 2030. As Global Citizens, their goal is to stand against the greatest injustice of our time: extreme poverty. A world that deprives 1.3 billion people of their basic rights and opportunities is unjust, and unacceptable. Global Citizens know that something must be done about it. They celebrate the efforts made to cut extreme poverty by half, but recognise more still needs to be done. People living in extreme poverty are working hard themselves, and that we all need to learn, and take action, to change the rules that trap them in broken systems. Using Global Citizen the team unites and amplifes our collective voice, working together to learn more and take action on issues that perpetuate extreme poverty. We share our passion for the issues we care about, and mobilise around crucial moments for change.